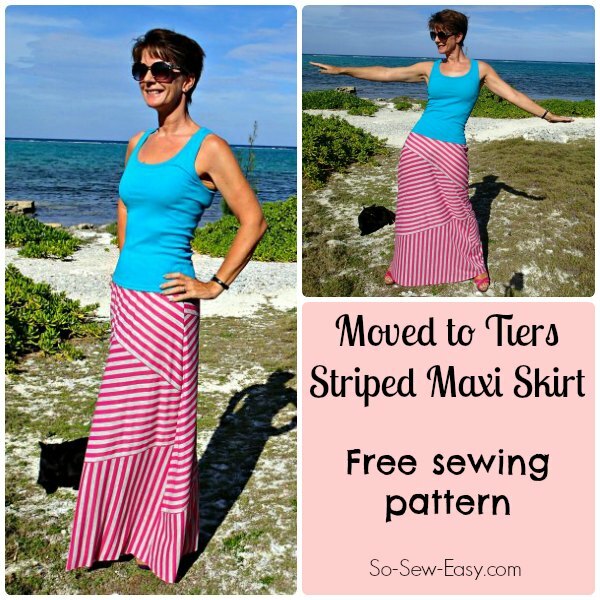 This maxi skirt has 3 tiers and the option to have the bottom tier with horizontal or vertical stripes. Comfy elastic waist and plenty of volume for swishing about. Keep it long for an elegant look. It looks good in wide or narrow stripes but of course, you don't have to use a stripe – you can use any fabric. Recommended for knit fabrics only. Enjoy your skirt and have a great summer! Find more details and the Striped Maxi skirt pattern here. Love this skirt – great use of stripes!